Great for smaller living rooms, this sectional group combines comfort with compact style. A sofa combines with a beautiful chaise at the end of the group, perfect for those who want to stretch out and relax while watching television or reading a book. Enjoy the comfort of plush cushions and luxurious fabrics. An easy, casual style allows this combination to fit into your room easily, adding a simple elegance to your decor! The Masquerade Casual Style Sectional Sofa by Rowe at Saugerties Furniture Mart in the Poughkeepsie, Kingston, and Albany, New York area. Product availability may vary. Contact us for the most current availability on this product. C391C-LSC Left Side Chaise 1 33" 68" 37"
C392-RSE Right Seat End 1 54" 40" 37"
Leg or Skirt Skirted Bases. Enjoy the Casual styling of this versatile sectional sofa group. 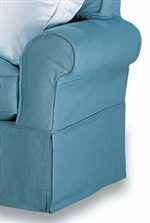 Whether relaxing with the family or watching a movie with friends, relax in the supportive softness of this collection. Featuring softly rolled arms, amply cushioned pillows and a durable frame, this sofa is made with longevity-and also your comfort in mind. Tailor the collection to your needs with several component options that can interchanged. 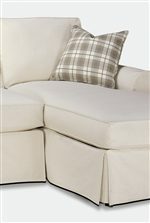 Choose from a variety of fabrics that allow you to match the sectional to your personal decor. Bring the simple elegance of this collection into your home today! The Masquerade collection is a great option if you are looking for Traditional furniture in the Poughkeepsie, Kingston, and Albany, New York area. A Softly Rolled Arm and Elegant Skirt Add a Classic Look to the Collection. A Chaise is an Elegant and Comfortable Addition to the Collection. Browse other items in the Masquerade collection from Saugerties Furniture Mart in the Poughkeepsie, Kingston, and Albany, New York area.